Shell-damaged roof of Amiens Cathedral, France, during World War I. 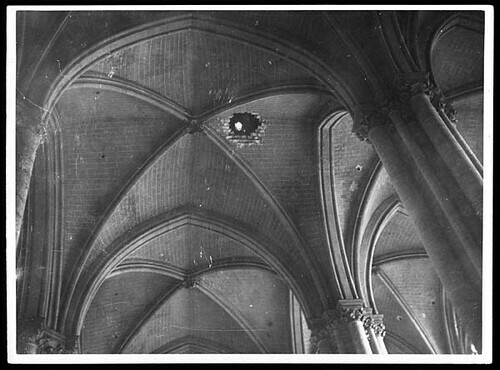 The bomb damage to the roof of Amiens Cathedral, which was caused by German artillery fire. Looking closely at the damage one notes the large size of the bricks that were used in its construction, plus the fact that the roof contains at least three layers of brickwork. Fortunately, unlike the cathedral at Arras, Amiens Cathedral only suffered superficial damage during the conflict. Located in the heart of Picardy, Amiens Cathedral, is one of the largest 'classic' Gothic churches of the 13th century, and is very similar in style to Notre-Dame in Paris. The tallest complete cathedral in France, it represents the pinnacle of gothic engineering in France and was the last of the extremely tall church buildings. Various measures were taken to protect the building from bombs during both world wars, and this perhaps explains the relative lack of damage.